New Diana that has displaced the one I have been with for four years, is male and clearly the dominant fish. 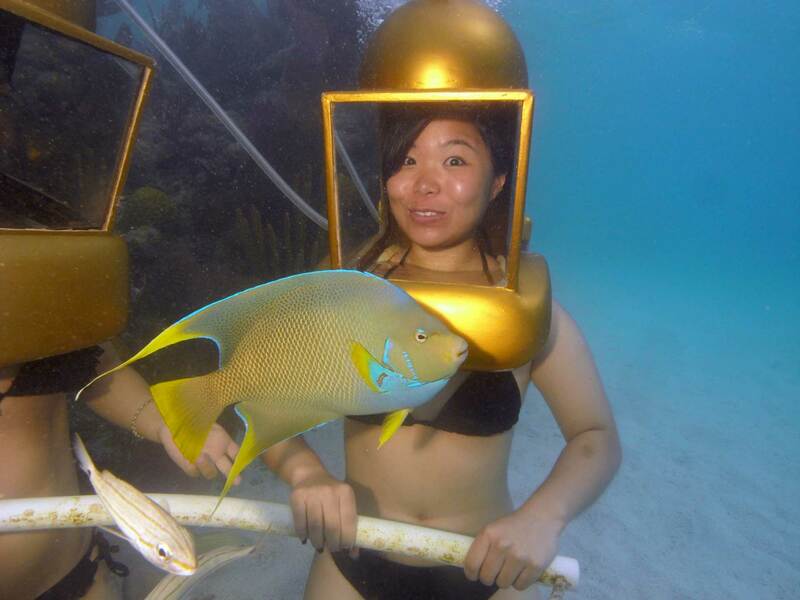 Her official title is, Holacanthus Bermudensis, but we call them Bermuda angelfish. Diana will grace you with her charm and beauty. Her skin is rough so she can’t slip away if you grab her. If you do not try to touch her , she will approach you within inches, to either pose in your photo, or to be fed. She is very clever and demonstrates this by swimming through a hoop. Diana swims very gracefully, eats very delicately and is not aggressive to fish of other species. Sad update! In 2002 a hurricane came close by and swept away all three well trained angelfish. It had been great because if one was full or did not feel like performing another would step in. The next year 2003 I trained another one and we were becoming good friends. She would go through the hoop and even pose for some photos. Then Hurricane Fabian took that one as well. Now there are only very small angelfish left so I will have to wait for some to grow up. C’est la vie. All 2004 season I worked with that very small angelfish. Things were progressing very slowly. My complaints around the dinner table prompted my daughter to remind me to be patient and that perhaps this angel fish was a dumb blonde of the fish world. No matter how I tried she would not come over to our windows and needed constant luring through the hoop with food. Fury not, fair flaxen females! The truth was revealed mid-summer when very large intimidating Stormin’ Norman went of to the annual spawning convention. Diana’s performance improved daily by great degrees. The conclusion is that she knew all along what was required, but she could not concentrate with that big scary snapper swimming all around. Her performance retrogressed upon Stormin’s return. With a bit of luck, as time goes by, she will not remember so vividly the times when she was so small that she had to fear most larger fish. As of July 23, 2011 we are still without a committed angelfish. Twice I brought sponges to our reef to tempt angelfish to be friends. I now have one who will go though the hoop but will not eat squid and will not show up each dive. During the 2014 season we nurtured relationships with two angelfish who eventually posed quite well for photos. But then, you guessed it, Fay and Gonzalo took them away. We will bring more sponge to the reef (angelfish crack) and develop new relationships.